I have just received an unusual novelty radio: the Funtape Model 800 with a RADIO PACK Model rp-800a AM Tuner cartridge. Made in Japan. It appears to be a 2 track cartridge player, and luckily the AM radio cartridge came with it. It works great but I can't find any information on this little machine anywhere. Have any of you seen this or know anything else about it? I came across a radio pack also. I do not have the player , but the tuner is identical. Is it worth selling ? do you know what it is worth? It is worth something for sure, especially to someone who has the player for it. Keep watching this topic on here and you find find a radio guy who needs this, or try the other sources like eBay. It has a demand factor and it will be fun to see if other kind of packs are still available for this player. If it is the FM pack then I would definatley want it!! I am glad you found these forums and good to see you on here! I imagine you have a blue 1968 Triumph too? Hi folks, I can tell you that I also got a Funtape "Music Pet" with Radio Pack AM Tuner. Unfortunately, no info whatsoever is available on the Internet. I wonder if they also made an FM cartridge? I rather doubt it. FM was still in its relative infancy at the time, and FM transistor radios were few and far between. Also, they were rather costly due to being hard to build, and I can't see this 'FunTape' unit as having been particularly expensive. They might've had plans to eventually offer one, but I doubt it came to fruition. Getting back to the unit/format at hand, it seems rather interesting. I wonder if it's at all related to the PlayTape format from the mid-late '60s. Does anyone have any examples or pictures of the "FunTape" cartridges used in these machines? The tuner packs give some idea of a cartridge might've looked like, but without any semblance of the actual tape opening, it doesn't help much. Granted, good pictures of PlayTape cartridges aren't common either, but it'd be a start. Hi folks, could someone find out the name of the manufacturer ? Funtape ? Music Pet ? I made many pictures of this extremely rare item, pls advise in case of interest. Tiny, flash in the pan tape format similar in concept to a mini 8 track. It used a stereo head to play two individually accessible mono tracks. Consider it the tape version of an RCA 45 RPM player. Yeah, I posted it as an example. I'm curious as to whether or not the "FunTape" cartridge is similar to it, or if two companies somehow managed to come out with entirely different 2-track mini-cartridge formats which went (mostly) nowhere. There seem to be minor similarities to the end of the 'Radio Pack' used in the Music Pet, but without dimensions, or seeing what the 'business end' of the tape loop in a FunTape cartridge looked like, it's impossible to tell. I've had a radiopack for many years and always wondered it's purpose, and now I've figured it out. Yes, the funtape 800 is a 3rd party playtape player unit. When I try to insert the radiopack into my playtape player it's a perfect fit... except for a protrusion on the top of the tape which I assume was designed to prevent this from being used with anything other then the funtape model player. This design allows funtape player to accept standard playtapes. On the bottom of the radiopack you will notice two electrical contacts near the front left and right edge. These are identical in location to the playtape's alignment grooves as seen on my playtape player. They are plastic and help to align the cart. position. On the funtape these serve a dual purpose, to lock in standard playtapes and to energize the radiopack. Also when you look at the head location, and style on the funtape it's identical to the playtape. So it's safe to assume the funtape is a playtape player with special provisions that allow it to play it's proprietary radiopacks. This made fiscal sense because they could develop a cheaper 'tape only' player, then customers can choose whether or not they want the radio option, and provided the promise of flexibility to upgrade to the looming FM broadcasts in the future, not locking the unit's board into a strictly am design. It was a win win for them except playtape had quite a short lifespan with limited support from major labels. 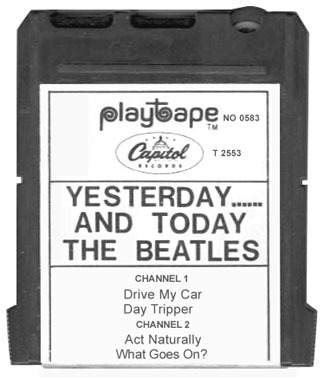 4-track and 8-tracks were superior in fidelity, but playtapes were more convenient. The demand for portable music was more focused on automotive applications at the time, and rightfully so as vinyl records and open reel dominated the home market. 8-tracks with their four selectable tracks of hifi stereo, and larger, more substantial, and durable cartridge offered better real estate for artwork and quickly became a mainstream format leaving playtape and 4-tracks in the dust.